The alien Kree are on a killing spree, leaving behind a message: Join or die. Thousands of Inhumans have already made their choice — the evidence floats, bleeding, in space. Attilan died screaming without its king. Now Black Bolt, monarch of the Inhumans, sets out for vengeance — but will he lead the last of his people to their deaths? The Kree have a weapon of their own — one that will teach the Silent King what it truly means to be voiceless. When Vox strikes, Black Bolt will be left a wounded prisoner — and the Royal Family lambs to the slaughter! It’s an Inhuman massacre as rising star Donny Cates and sensational artist Ariel Olivetti bring the royals to the lowest point in their long and storied history — and quite possibly their last! 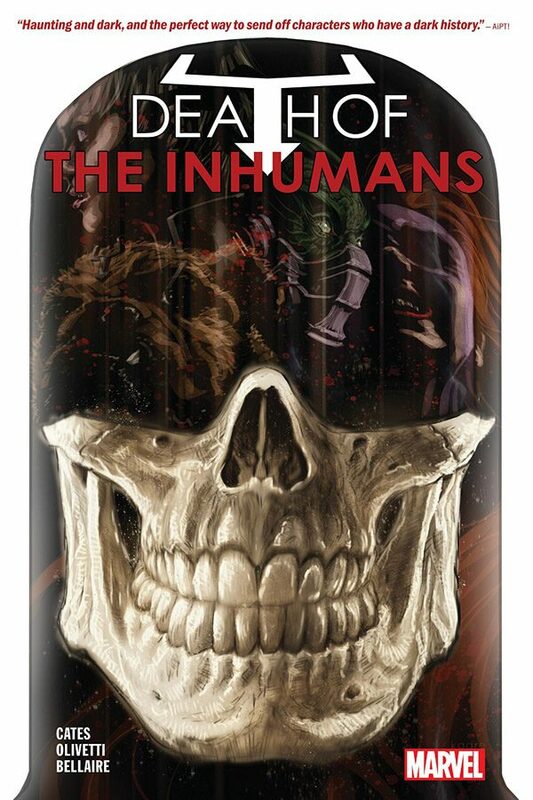 Collects Death of the Inhumans #1-5.